A convicted killer failed today in a bid to secure a reduced sentence for beating and stamping his helpless victim to death. Mark Ward, 27, was challenging the minimum 16-year prison term he received for murdering father-of-four Marcell Seeley in Lurgan, Co Armagh in October 2015. Ward’s lawyers claimed the sentence was manifestly excessive as the fatal and drunken attack involved no planning. But the Court of Appeal rejected submissions based on the two men’s history of drunken quarrels, injuries inflicted and a mere intention by Ward to inflict grievous bodily harm. Mr Seeley’s body was discovered in the living room of his Dingwell Park flat. The 34-year-old, also known as Junior, died from blunt force trauma to the head. He had also sustained multiple injuries, including fractures to his ribs and a bone just above his voice box. A pathologist concluded that he would have survived for several hours after the attack. 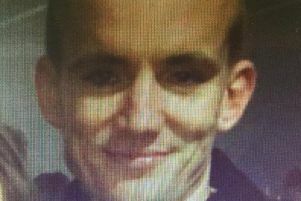 Ward, from Drumellan Gardens in Craigavon, was convicted of murder after footprints found at the scene linked him to the attack. A distinctive sole pattern was matched to shoes worn in CCTV footage of him walking towards Mr Seeley’s home on the night of the killing. Following an earlier failed bid to overturn his murder conviction, he returned to court in an attempt to have his jail term cut. Ruling on the appeal against sentence, Mr Justice McCloskey rejected defence arguments on the sentencing process. “A murderer’s intention to cause grievous bodily harm, rather than to kill, will not invariably attract mitigation,” he said. “Futhermore, in appropriate cases there will be no distinction between an aggressor’s use of feet for the purpose of kicking or stamping on a helpless victim prostrate at ground or floor level and the use of a weapon for a like purpose. Dismissing the appeal against the 16-year term, appeal judges also highlighted differences between sentencing in Northern Ireland and the “more prescriptive” tariffs in other parts of the UK. Heavier tariffs in England and Wales are based on that jurisdiction’s different regime, while a 2005 review of the life sentence in Northern Ireland resulted in no reforms. Mr Justice McCloskey pointed out: “In short, there has been no statutory alteration of the legal rules and principles governing the life sentence in Northern Ireland during almost two decades, since the introduction of the Life Sentences (NI) Order 2001.